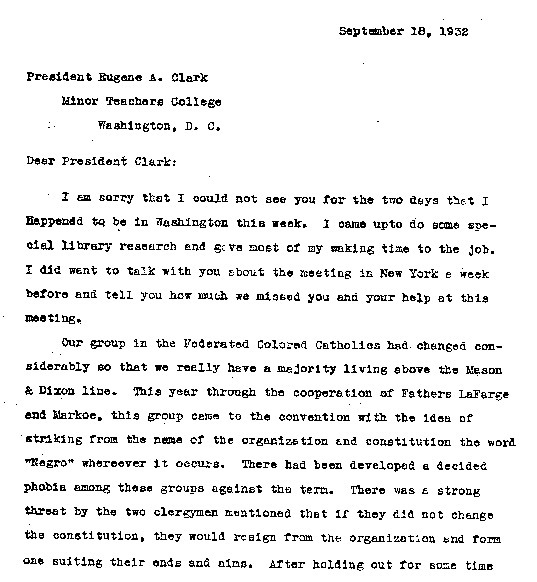 Shortly after the convention in New York in September 1932 Turner wrote a letter to a Federation supporter reporting on the issues debated there. Turner discussed Fathers LaFarge and Markoe and the controversy over whether the Federation should focus on interracial activity or on promoting racial solidarity. What are the main points of Turner's letter to Clark? How have Turner's emotional state and opinion of Fathers LaFarge and Markoe changed since he wrote Aldrich in March 1931? What have the two priests done that changed Turner's opinion of them? How is Turner different from LaFarge and Markoe? How might these differences affect their relationship? Turner stated that "no individual is indispensable to a movement." Why did he say this? Explain why you agree or disagree with his statement.